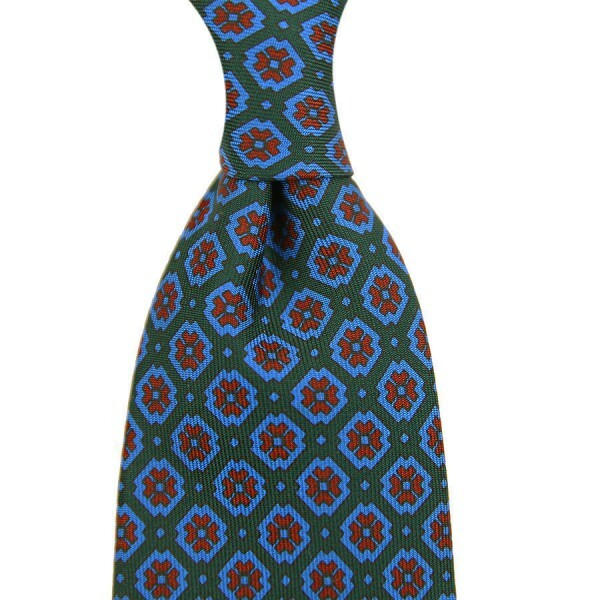 Product information "Ancient Madder Silk Tie - Forest Green - Handrolled"
In the quiet hills of the British countryside lies the traditional heart of English silk printing: Macclesfield. Once home to numerous manufactories that produced the inimitable screen-printed silk connoisseurs love so dearly, today there are only two left that produce what internationally became known as “British Neats”. But the quality that comes out of these traditional places is still unparalleled: nothing beats the depth and character of hand-printed silk. The time-consuming printing process requires a lot of experience to get right, as the color reacts after printing with oxygen and forms the final shade: a delicate process, requiring a delicate hand. The result is a lush, rich, almost 3D-like effect we just love. Real ancient Madder silk is produced by only a handful printers in the world. The process is complicated and time-consuming, but unsurpassed: no other dying method produces these rich, vibrant colors, clear contrasts and unmistakable Madder color palette in deep blue, warm orange and red. Related links to "Ancient Madder Silk Tie - Forest Green - Handrolled"